I caught myself the other day engaged in some slightly odd behaviour. I was out in the road in front of my house cleaning leaves out of the gutter. Had I finally become the crazy old man I have long aspired to? Possibly. However in this case I was doing a chore that makes perfect hydrological sense – making sure my local drainage network (in this case the storm drain grate outside) was clear so that my house was well protected against flooding. Where I live is a very low flood risk (find me a hydrologist about whom that statement is not true!! ), and the biggest (probably only) risk is from surface water, or pluvial flooding. Generally when most people think of flooding it is with images of rivers bursting their banks or torrents of water surging down steep valleys. However there are four broad types of flooding: fluvial (more water in a river than it can convey), pluvial (surface water flooding, typically urban drainage related), groundwater (the water table rises to ground level) and coastal (typically high tides coinciding with a storm). Pluvial flooding is an interesting one as it is primarily a function of urban infrastructure. Our towns and cities are packed full of impermeable surfaces which cause rainfall to pool or run rapidly off. Drainage systems are designed to transport this water quickly into sewers and surface water channels and thus prevent urban flooding. With climate change surface water drainage is coming under increasing pressure, however there are more prosaic challenges in simple maintenance. 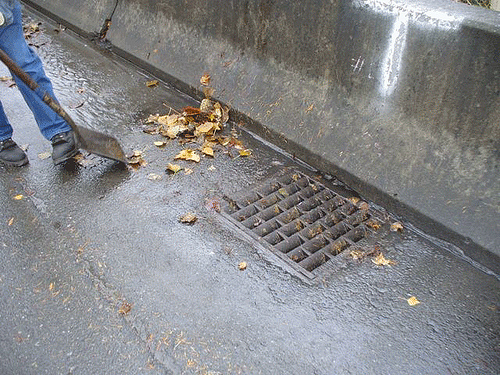 In the Autumn dead leaves typically collect in roads, and in moderate rainfall events can be washed into/on top of storm drains/gutters/gullies. These leaves then block or reduce the conveyance of water into the drains and increase local flood risk. So far so obvious. Although it seems sensible to keep this drainage network clear there are a fascinating range of approaches in different countries as to how this should happen. There seems to be a particular split in how people in the UK and USA view the issue. Which likely has its roots in the differing role of the state in people’s everyday lives, and people’s opinions on the role of the state. In the UK the prevailing attitude is that it is the responsibility of the authorities to monitor the drainage network and keep it clean; effectively individuals and business abrogate all personal responsibility. This makes sense to a degree as there is theoretically one point of responsibility. However in reality this is rarely the case. 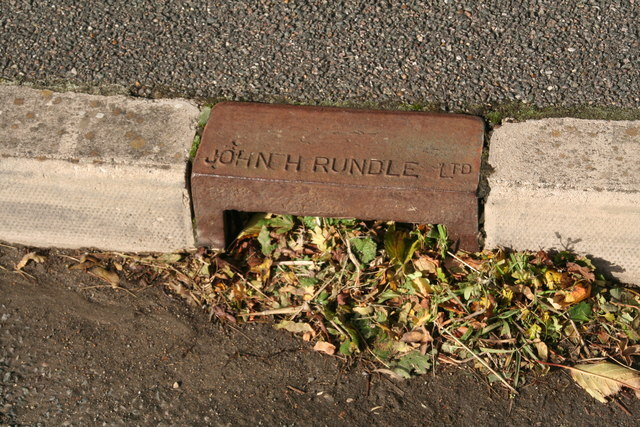 Town councils can be responsible for cleaning the streets and the surface of drains, water companies may take over responsibility at the point things move underground, the Environment Agency may have responsibility when the water gets into a water course (but that may depend on the size of the channel), in some areas there are also Internal Drainage Boards. A quick (and unscientific) look through recent local news stories in the UK shows numerous calls/reports for more money and/or more action on drain and gully clearance. There is an interesting story from Nottinghamshire in which one local high street trader says “there is an element of frustration that the gullies haven’t been cleaned as often as they should have”, and from a councillor in Essex “we also call on our partners .. to keep their drains, ditches and other assets in good order to ensure that flooding can be prevented where possible.” The emphasis is very much on “the authorities” to not only keep on top of cleaning, but to be aware themselves of where this cleaning needs to be done. However the majority of cleaning appears to done only twice a year. Contrast this with a recent survey in the US which reported 1/3 of people regularly rake leaves from storm drains (like your slightly odd correspondent); a number, which is reported by The Seattle Times as being surprisingly low. In parts of the US there are annual campaigns to encourage residents to monitor drains and those who spot a blocked drain to report it to the relevant authorities or to clean it themselves, with practical and safety tips offered. In North Carolina there are even fines for “littering” leaves from your garden into the street with a leaf blower. I’m not sure putting the emphasis on individuals to clean municipal storm drain grates is the best way forward, not least because I suspect it would disproportionately disadvantage areas with lower community cohesion. 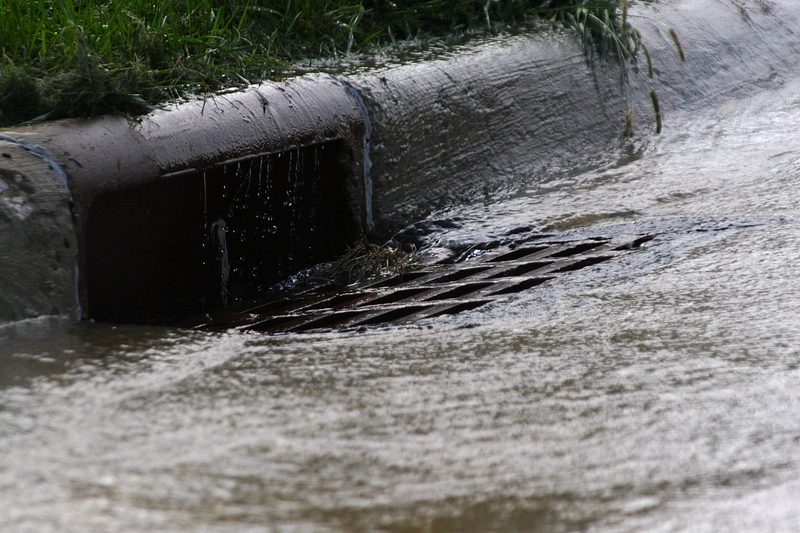 However it is eminently sensible to be aware of your own pluvial flooding risk, to be aware of where the nearby storm drains are, and at the very least monitor these regularly and inform the local council (or relevant body) if these are in need of cleaning/maintenance. Not least because it is an area where local knowledge is likely to be invaluable. There is good recent UK example of a road in which flooding was reported by residents as being due to drainage problems, monitored by residents following initial work and thanks to their vigilance (and persistence) a further, internal problem with a sewer was identified and repaired. This problem would be highly unlikely to be identified in any routine maintenance. Science can also help with the problem of blocked drains. Two researchers from Genoa were recently awarded the 2014 Dyson prize for an invention of a “self-cleaning” drain cover which separates out solids and water, using the water to power turbines to push the leaves out of the drain (where they then need to be cleaned off). Dr Karen Scott from University of Leeds did a PhD on gully pots (internal part of drains that trap solid material) finding that the in situ decomposition of leaf material was not currently viable, and thus drains needed to be cleaned regularly to remove leaf litter. She concluded that remote monitoring to identify blockages could help in flood prevention, but crucially that being proactive in identifying and correcting blockages is effective. Where possible individuals, neighbour groups and local flooding forums can potentially play an important role in monitoring local surface water drainage networks, particularly at this time of year, and help identify and report any maintenance issues. It’s not a complete solution, but engaging people with urban hydrology and especially getting people to take a degree of responsibility for awareness of their own flood risk can only be a good thing. This entry was posted in Flooding, Hydrology, Politics, Urban rivers. Bookmark the permalink. Your post help us with the problem of blocked drains, thank you for the effort you made in writing these tips.